Editor(s): Manning, J. G.; Hemenway, M. K.; Jensen, J. B.; Gibbs, M. G.
The Astronomical Society of the Pacific (ASP), in partnership with local host San Jose State University and a number of co-sponsors, hosted a national education and public outreach (EPO) symposium in conjunction with its every-third-year "Cosmos in the Classroom" symposium for college introductory astronomy instructors. This combined conference was the 125th annual meeting of the ASP, founded in 1889, and which today continues to advance science literacy through astronomy. 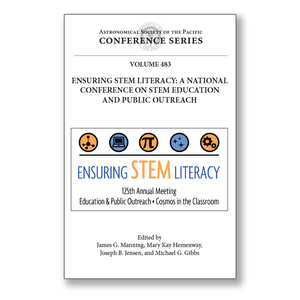 The conference provided a forum for those engaged in various aspects of astronomy, earth and space science EPO, college astronomy instruction, and other forms of formal and informal science education and communication, as well as science and education research, to gather and share experience, expertise, and perspectives on "Ensuring STEM Literacy," which formed the organizing theme for the conference. The conference included, among its participants, scientists, NASA and NSF funded EPO professionals, K-12 teachers, college and university educators, informal science educators from a variety of venues, communicators, and other professionals. The ASP regularly publishes both scholarly and educational materials, conducts professional development programs for formal and informal educators, and holds conferences, symposia, and workshops for astronomers and educators specializing in education and public outreach. The ASP's education programs are funded by corporations, private foundations, the National Science Foundation, NASA, private donors, and its members. More information about the Society, its products and services, and how to become a member of the Society and support its work may be obtained at its web site: www.astrosociety.org.